Coaching Tools lets you not only tie a video recording to a swim meet, you can tie it to specific swimmers, heats and lanes. Tap a button to advance to the next heat and keep going. Note this only works when a meet is in SwimOffice and is a TouchPad meet or has an ev3 file attached. Here is how. In OnDeck, tap Menu > Coaching Tools > Video Producer. If there are unseeded swimmers in the current event and heat (or no swimmers in the event), a dialog will alert you and you can tap Setup to seed them, or Later to skip. Tap ---/-- in the H/L column to assign each swimmer to a heat and lane. This works just like the Run Meet function in OnDeck. Tap SAVE when finished, then tap < in the upper left twice to return to the video recorder. The controls on the right will start on event 1, heat 1, all lanes. If swimmers are assigned to this event, you will see their names at the top. The following controls are available. Tap the green E + button to advance to the next event. Tap the blue H + button to advance to the next heat. If swimmers are assigned to this heat, you will see their names at the top. Tap the brown All lanes button to enter a specific lane, DONE. You will then see only the swimmer's name assigned to that lane, if any. Tap < to open a menu where you can directly enter the event #, heat #, lane #, Undo the last action, and tap Assignments to seed swimmers (see next step). After recording an event using the red record button at the bottom, use controls in step 6 to move to the next event or heat and keep recording videos. When you have recorded the last video, tap FINISH in the upper right. Tap the desired video to edit. Make any changes and tap SAVE. See edit Coaching Tools videos for more info. You can tap UPLOAD while editing a video, or select one or more from the list and tap UPLOAD. The video(s) will then be visible to your team (depending on how you set the visibility level for each video). 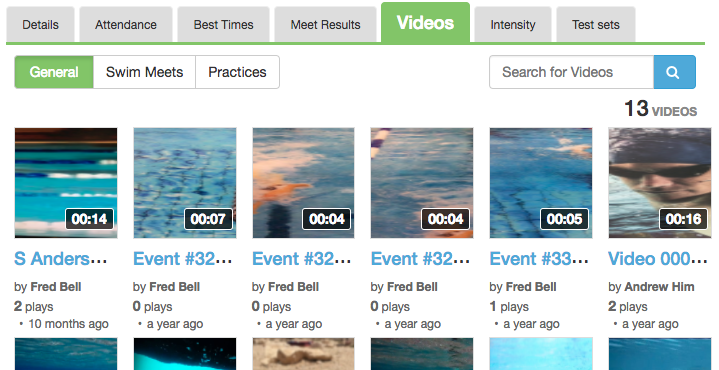 Members can click the Videos tab in their profile and see videos in which they were tagged in the General, Swim Meets and Practices tabs.